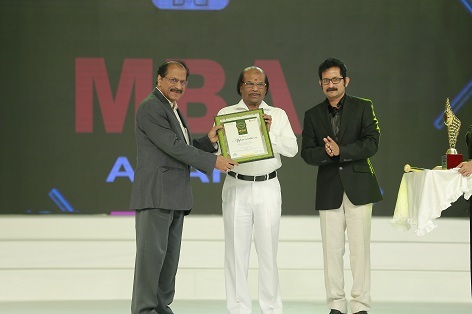 Jyothy Laboratories’ Managing Director and Chairman Mr. M P Ramachandran felicitated with the eighth MBA award, which is given to those socially responsible business personalities who have two thousand crore Indian rupees or more worth asset. MBA Award is a highly exclusive business achievement award organized by Pegasus Group in association with Unique Times, Premium business lifestyle magazine. MBA Award recognizes and felicitates outstanding Indo Malayalee business achievers. Even though it’s a business achievement award, it is not just about the money, the nominees corporate social responsibility (CSR) activities are considered highly for the Award. The Federal International Chamber Forum will be a guild of the MBA Awardees, where only one person will be admitted to the forum in a year. The forum will further reinstate the importance of such an Award. Since it will be an association of the Awardees, the forum will be highly exclusive. The forum will be a rendezvous of this great business minds and their ideas which in turn can be used for the social good. FICF as a premier forum of the Malayalee Business Achievers will be the richest club among the Malayalee Business Fraternity. The forum also will be one of its kind and one of the richest forum in India considering the members’ wealth. The FICF will be thus an aspiration for every entrepreneur, as it stands for outstanding achievement, excellence in business and a big heart for social causes. The Jyothy Laboratories’ Chairman received the award in a special function on January 27 at Gokulam Convention centre, Kochi. He was honoured the award by Mr. V P Nandkumar, MD & CEO of Manappuram Finance Ltd& immediate past Chairman of the Kerala state council of the Confederation of Indian Industry (CII) in presence of Dr Ajit Ravi, Chairman of Pegasus & Editor of Unique Times. V P Nandakumar (Manappuram Finance’s MD and CEO), Joy Alukkas (Chairman, Joy Alukkas), M A Yusuff Ali (MD, Lulu group International), T S Kalyanaraman (Chairman and MD, Kalyan Jewellers), P N C Menon (Founder and Chairman, Sobha Group), GokulamGopalan (Founder and Chairman, Gokulam Group of Companies), and Ravi Pillai (Founder and MD, R P Group of Companies) are the previous years’ winners.